The shoulder joint is the most flexible joint in the human body. Similarly to the hip joint, the shoulder joint is a ball and socket; however, the shoulder does not have as much bony congruity as the hip. Moreover, the shoulder joint’s integrity relies on the surrounding muscles, tendons and ligaments. There are many labels that can be used to diagnose shoulder pain, such as bursitis, impingement, labral tears, rotator cuff tears, adhesive capsulitis, and tendinitis. In this post, I will cover the shoulder’s basic anatomy, as well as explain how I assess a shoulder. I will conclude by offering a few exercises for improving shoulder function. 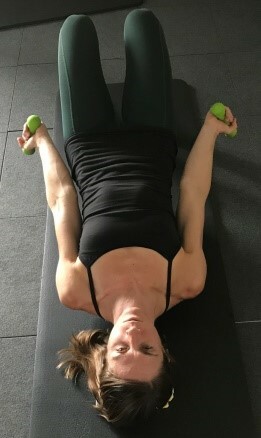 The shoulder is a unique joint in the sense that it allows us the mobility of the upper extremity to perform fine motor tasks with our hands and in many ranges of motion. When I refer to the shoulder, I am really speaking about the 4 joints which make up the shoulder complex. The gleno-humeral joint is the joint we typically think of when referring to the shoulder. This joint is created by the shoulder blade and the humerus. The sterno-clavicular joint is made up of the sternum and the clavicle. This is the only bony attachment for the entire arm to the skeleton. The acromioclavicular joint is made up of the top of the shoulder blade and the collar bone. This joint is the top of a little tunnel at the top of your shoulder and is often an area where tissues can be pinched. The final joint is the scapulo-thoracic joint; this is the space between your shoulder blade and your ribs. The shoulder complex relies on many muscles to create optimal movement, particularly two muscle groups: the scapular stabilizers and the rotator cuff muscles. Scapular stabilizers include any muscles that attach from the trunk or spine to the shoulder blade. These muscles control movement of the shoulder blade on the back of the ribs. The rotator cuff muscles are a group of 4 muscles that originate on the shoulder blade and attach to the humerus. These muscles form a sleeve around your gleno-humeral joint and are responsible for keeping the head of the humerus in the center of the glenoid (anatomical name for the shoulder socket). Ideally, the scapular stabilizers and the rotator cuff muscles are in sync and can keep the joints centered during movement. However, this is not always the case. When a client comes in with shoulder pain, my first responsibility is to always check for red flags - signs and symptoms of serious pathology. For example, a heart attack can present as shoulder pain. Should a situation arise where I suspect something more sinister is going on, I would refer the patient to the appropriate medical provider. Otherwise, my evaluation starts with observing the client’s posture, scapular position at rest, bone structure and noticeable muscle hypertrophy or atrophy. What I observe is just a piece of the puzzle. For instance, if someone has asymmetrical shoulder girdles, I do not assume that is the cause of their pain. It’s only an observation. The next thing I assess is the client’s range of motion, specifically overhead motion. This is where I can start to see what muscles engage when the arms raise; how the shoulder blades move on the ribs; if they feel pain; if they can lift their arms 180 degrees; and other various and relevant phenomena. Also, what happens to the client’s spine when the arm goes overhead? Most of the time, with my clientele, determining what is causing the limitation in their range of motion will be important for their treatment and maintenance plan. If I find it necessary, there are “special tests” I can perform to roughly identify the specific tissue at fault. While it is important to identify if there is a serious structural issue going on, I find it is still imperative to treat the limiting factors in the client’s range of motion. For example, if someone is experiencing “impingement,” an umbrella term for pain in the shoulder when lifting the arm overhead, I want to identify why the tissue is getting impinged in the first place. I may have to utilize more manual therapy in order to assist the joint in obtaining optimal movement. For the sake of my time and yours, we won’t go into this topic further. The only difference here is my treatment plan would be different for this client versus the one who is highly functioning. Back to assessing range of motion. Since the integrity of the shoulder complex depends on the muscles surrounding it, an understanding of how muscles function is helpful for keeping it healthy. Instead of thinking about muscles as strong or weak and tight or loose, I suggest approaching them as dominant or non-dominant. A common pattern I observe in the clinic is a client’s pecs, lats, and upper traps will prefer to work in a shortened or concentric position. When they go to lift their arm, the shoulder blade will hike towards their ear. What I want to see is the shoulder blade drop down and the socket of the shoulder joint point upwards, matching the angle of the arm bones. This requires the lats, pecs and upper traps to elongate. The muscles may not have the movement pattern programmed in the brain to complete this task. Therefore, releasing or passively stretching these muscles may not change your ability to lift your arm overhead with an optimal movement pattern. Consequently, I utilize modalities which release tissues but only for pain relief or a quick fix to obtain more range of motion in a joint. Lately, I have been using handwriting with your non-dominant hand as a metaphor for movement patterns in the shoulder. If your goal was to write with your non-dominant hand just as well as your dominant hand, you would have to practice the skill. The same goes for the muscles in your shoulders and all over your body. Learning a new movement pattern takes focused practice and time. Below are 3 exercises you can try for improving the efficiency of your shoulder movement. 1: No Angels on the Oov. If you don’t own an Oov, you can try this exercise on a foam roller, but just know that the foam roller is flat and your spine is not so positioning won’t be as easy. Directions: Lay on the Oov with head supported for comfort if necessary. Start with your arms up. Spin your thumbs outwards, then open the arms out to the side until they’re hovering at about the height of your body. Keep them hovering at that height and arc them down to your hips then up to your ears as if you were tracing wings of a snow angel. 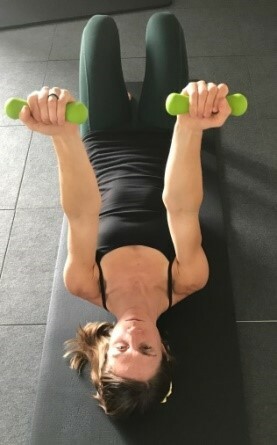 Use light weights (1-3lbs) Key points: Maintain the backwards spin of your shoulders. Keep your elbows straight. MOVE SLOWLY. This exercise should be a lot of work. 2: Scarecrow: This is a Pilates exercise. Feel free to do the entire exercise or just parts of it. Directions: Lay on your stomach with arms in a “goalpost” position. Start by lifting the forearms off the ground. Then lift the elbows by pulling the shoulder blades towards the spine. Then reach your arms out to an overhead position, with thumbs pointed up. Key points: Try to keep your spine in neutral (the original exercise calls for extending your thoracic spine, but I find too many clients overextend from their lumbar spine. I like to train the front of the body to come in and control while the back of the body is working). When arms extend overhead, try to keep from hiking your shoulder blades towards your ears. 3: Single arm overhead press: Stand in front of a mirror to watch your form. Use a weight (1-10lbs) or a can of food if you don’t have a weight at home. Directions: Start with elbow bent and lifted to shoulder height. Your palm should face inwards. Keep your elbow directly under your hand so that you maintain a vertical forearm position. Press the weight straight up, ideally so the elbow straightens all the way. Slowly lower back to starting position. A common fault with this one is the hand will spin in and the elbow will spin out so use a mirror to see that your forearm stays vertical. 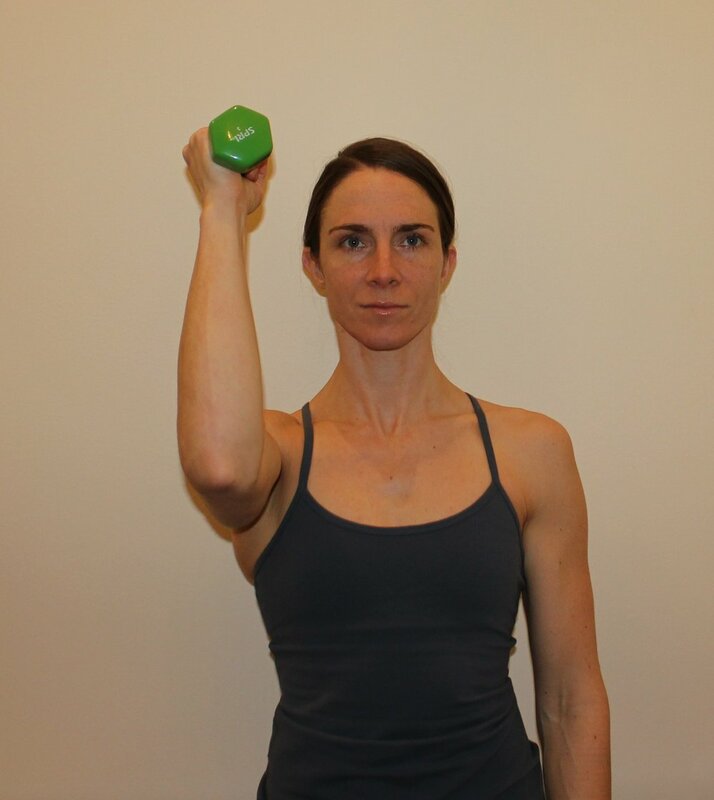 The emphasis of this exercise should be on the shoulder blade gliding outward as the arm lifts. Key points: Keep your wrist straight. Don’t shrug your shoulder. Keep your torso squared forwards. Move slowly and in control. Suggested sets and reps: 3-5 sets or 6-10 reps.